No. 2 Norcross 81, King’s Ridge 52: Rayshaun Hammonds was dominant as he scored 30 points, grabbed 14 rebounds and added three assists. Jordan Goldwire scored 13 points and dished out six assists. Dalvin White added 11 points and four assists while Lance Thomas and Kyle Sturdivant both chipped in nine points apiece. No. 9 Newton 90, Eastside 60: J.D. Notae poured in 39 points to lead the Rams. Jaquan Simms netted 18 points. DeAndrae Butler caused problems inside with his 12 points and 16 rebounds. Freshman guard Ashton Hagans contributed 12 points in the win. McEachern 65, Newnan 61: Darius Jones scored 16 points in the Indians win. 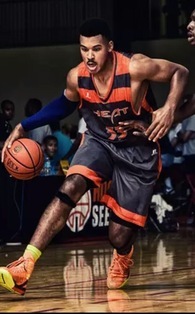 The size of McEachern hurt Newnan as Bryce Smith and freshman Isaac Okoro both posted double-doubles. Smith finished with 15 points and 10 rebounds while Okoro scored 10 points and grabbed 10 boards. Hillgrove 69, Mill Creek 55: In the battle of the Hawks, guard play propelled Hillgrove to victory. Demeirre Black scored a game-high 22 points while Brandon Williams pitched in 15. Charles Botchway led Mill Creek with 12. Duluth 71, Druid Hills 45: Obinna Ofodile wreaked havoc in the paint and helped the Wildcats to a blowout victory. The senior scored 24 points, grabbed 12 rebounds and blocked four shots. He also recorded seven dunks on the night. Four other players scored eight points in Duluth’s balanced attack. Meadowcreek 69, Clarkston 54: Trevontay Taylor went off for 36 points to help new head coach Willie Reese grab an early season victory. Dallon Hammons had 12 points off the bench. Brookwood 68, Peachtree Ridge 63: Sean Agnant netted a team-high 13 points while Amari Kelly and Jordan Benjamin scored 12 and 10 points respectively. Micah Kinsey did everything for the Broncos with eight points, 11 assists and nine steals. The Lions were led by Milz Tatum’s game-high 16 points and Jeremiah Starks’ 10. No. 1 Miller Grove 77, Stephenson 44: Five players scored in double figures to route the Jaguars. Aidan Saunders scored a game-high 17 points. Joshua Jackmon pitched in 14 points and 11 rebounds while UConn-commit Alterique Gilbert scored 12 points, handed out six assists and collected four steals. Aaron Augustin went for 13 points, nine assists and six rebounds. Raylon Richardson rounded out the attack with 12 points, nine rebounds and three blocks. Jamir Chaplin led Stephenson with 14 points. No. 2 McIntosh 89, Morrow 68: Will Washington handed out eight assists to go with his 20 points. Furman signee Jordan Lyons dropped 24 points and five dimes. Chase Walter posted a double-double with 14 points and 12 rebounds. Dishon Lowery had eight points and 10 rebounds in the win. Morrow was led by Levitiscus Glover’s 23 points while Stanley Henderson added eight. Fayette County 78, East Coweta 39: Noah Gurley was big inside for the Tigers as he posted 25 points and 10 rebounds. Jaylon Cheffin added 15 points in the win. No. 1 Lithonia 66, Marist 44: Rodney Chatman led the way for the Bulldogs with 20 points and five assists. Jacara Cross went for 14 points and 14 rebounds while Tyheem Freeman chipped in 11 points and four rebounds. The War Eagles were led by Patrick Zeck’s 12 points. No. 5 Sandy Creek 75, Banneker 36: The Patriots continued their impressive early season debut under new head coach Anthony McKissic. Elias Harden scored 20 points, grabbed seven rebounds and added four assists. AJ Freeman went for 20 points and four steals. Christian Turner added 14 points, five assists and eight steals while Evan Jester had 12 points and eight rebounds. Keith Heard rejected three shots and came away with four steals. No. 6 St. Pius 60, Arabia Mountain 53: Kerney Lane exploded for 29 points in the Golden Lion victory. He received help from Christian Merrill and Jakob Spitzer who scored 14 and 12 points respectively. Arabia Mountain was powered by Darius Giles’ 18 points. No. 8 Henry County 55, Decatur 45: Damion Rosser played bigger than his size and finished with 14 points, seven rebounds and five blocks. Dominique Joseph chipped in 13 points. No. 4 GAC 73, 1A No. 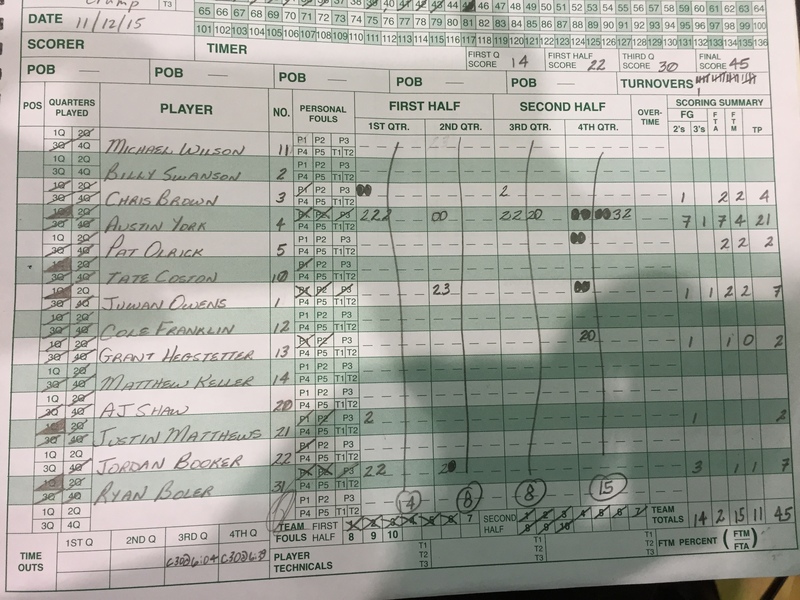 9 Lakeview Academy 61: Brian Coffey Jr. orchestrated the Spartan offense and led the team with 24 points. Garrett Covington showed off his versatility and scored 18 in the win. No. 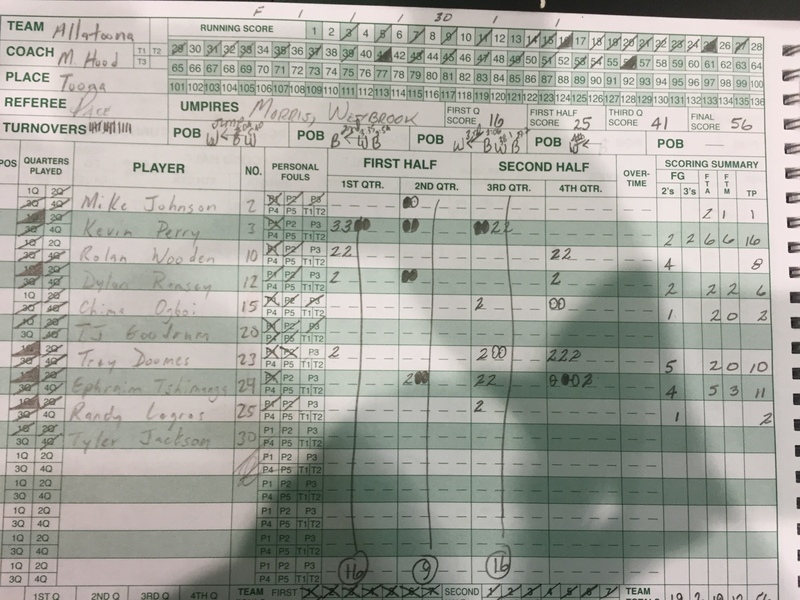 1 Greenforest Christian 80, WD Mohammed 50: Justin Forrest ran the show with 17 points and seven assists while big man Ikey Obiagu finished with 15 points, eight rebounds and five blocks. Precious Ayah added 11 points and five rebounds and Victor Enoh chipped in 10 points and five boards. No. 6 Landmark Christian 80, Providence Christian 58: The run-and-gun War Eagles were at it again as Zack Allen scored 24 points to power the high-flying offense. Collier Schultz poured in 17 and Micah McAllister finished with 15. Jeremy Hardnett led Providence with 16 points. Montgomery County 80, Toombs County 73: The Eagles bested the Bulldogs, but D.R. Meadows and Jalen Mobley shined in the loss. Meadows poured in 27 points while Mobley added 21. No. 2 Archer 61, No. 9 Mountain View 46: Archer trailed 13-2 to start the game but managed to take a 27-25 halftime lead. Junior point guard Tia Shorter scored 14 of her 21 points in the second half and added three steals and three assists. Archer teammate Autumn Newby battled foul trouble after picking up a fourth foul in the third quarter but finished with eight points and 10 rebounds. Indiana-commit Linsey Marchese finished with 12 points and nine rebounds. Mountain View was led by Alea Spears’ 10 points. Northview 43, Cambridge 19: The visiting Titans led Cambridge 20-5 at the half and took a 31-13 edge into the final quarter. Northview senior Courtney Watson finished with 10 points and freshman Ashlee Austin also turned in a 10-point performance while making her varsity debut. Shannon Titus finished with eight points and freshman Audrey Smith led Cambridge with six points. Miller Grove 55, No. 6 Stephenson 44: Host Miller Grove led 29-28 midway through the third quarter before growing a 43-32 lead with five minutes left in the fourth to hold off the defending AAAAA state champs. Miller Grove senior Chrystal Ezechukwu dominated the paint with a game-high 15 points and 21 rebounds. This is Miller Grove’s first win over Stephenson since the 2012-13 season. North Oconee 41, Madison County 27: The visiting Titans clinch their season opening win with a shared scoring effort by senior Lesley Holbrook and juniors Camryn Williams and Emma Weynand. Holbrook and Williams each finished with nine points and Weynand netted eight. Madison County and North Oconee have opened the last three seasons together, with the Titans winning each matchup (65-36 in 2013-14, 58-48 in 2014-15). No. 1 Holy Innocents’ 60, Riverwood 28: Holy Innocents’ sophomores Kennedy Suttle (15) and Kaila Hubbard (12) combined for 27 of the Golden Bears’ 60 points. Suttle added five rebounds and five steals to her game-high points and Hubbard added four steals. Senior Erika Cassell stuffed the stat sheet with nine points, eight rebounds and five steals and junior point guard Shai Blanding dished out seven assists. Walker 50, Galloway 45: Visiting Walker trailed 24-22 at the half and tied it 37-37 at the end of the third quarter, before outscoring the Scots 13-8 in the final frame. Point guard Saige Cornick-Turpin, who has been a starter since her freshman season at Sprayberry High School in 2013-14, opened her junior campaign in the Wolverines’ backcourt with a game-high 13 points. Teammate Jesse Baynes netted 10 points. Separated by less than a mile, heated rival Holy Innocents’ (24-6) makes the walk over to Riverwood (20-9) to tip-off the 2015-16 regular season. In last season’s early meeting, Holy Innocents’ came away with a 63-48 win at home, but three of the four leading scorers from that team are now gone from the Golden Bears’ roster. Sam Asbury (12 points) and Ashton Meertins (11 points) both have graduated while Travis Anderson (14 points) has transferred to East Jackson for his sophomore campaign. Luckily for Coach Terry Kelly, senior big man Brent Duncan and junior wing Cole Smith are back. Smith can be lethal from beyond the arc while Duncan does his work inside. Smith chipped in 11 points last year while Duncan, a 6-foot-7 high-flying forward with offers from Navy and UMBC, battled for nine points and eight rebounds. The difference last year proved to be at the foul line where the Golden Bears sank 20-of-27 while the Raiders were limited to 7-of-11. The key for success not only tonight but for the season, will be for Coach Buck Jenkins to find consistent play around Riverwood big man Kohl Roberts. The 6-foot-7 power forward certified himself as one of the best rebounders in the state last season, averaging 14.4 points, 13.5 rebounds and 4.2 blocks per game. He scored 16 points and grabbed 12 rebounds against Holy Innocents’ and added five steals. Senior guard Elijah Johnson will be asked to score a little more with the graduation of second leading scorer Jordan Renfro. Johnson scored 8.1 points per game in 2014-15, but was held to 1-of-7 shooting with three points against the Bears. Key Matchup: Two of the state’s best kept secrets inside will tussle one last time in the low post. Kohl Roberts of Riverwood is an old-school post player that gets the job done with his body, but can also leak out and lead the fast break. 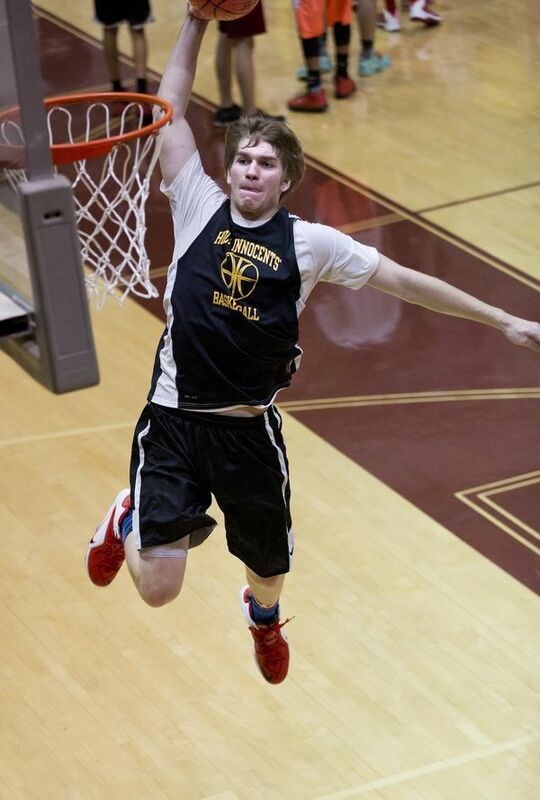 Holy Innocents’ Brent Duncan is a high-flyer that can change the momentum of a game with his thunderous dunks. Whoever wins the battle inside will give their team a great chance to win, but it will be up to rest of the team to take it to the finish line. X-Factors: Holy Innocents’ junior forward Jules Erving will take on a bigger role this year after showing flashes as a sophomore. The athletic 6-foot-5 big man is related to a certain NBA Hall of Famer, but I’ll let you guess who that is. His activity around the rim could spell problems for Riverwood. The Raiders’ Elijah Jenkins brings an outside threat that will be sorely needed after the graduation of Jordan Renfro. Jenkins, a junior, finished second on the team in three-pointers made, but will need to improve upon his 30 percent clip. The city of Acworth hosted a preseason meeting between my 5A preseason No. 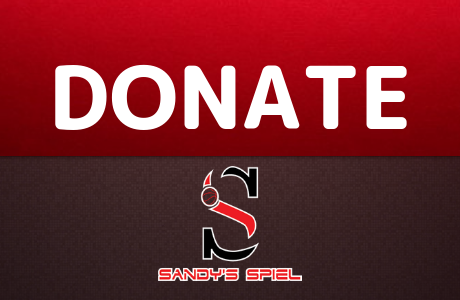 4 Allatoona Buccaneers against the visiting 6A Harrison Hoyas, who I deemed as one of my Super Sleepers (https://sandysspiel.com/sandys-spiels-super-sleepers/) this upcoming season. The Hoyas managed to hang around with the Bucs in the first half, trailing 16-14 at the end of one and 25-22 at the half thanks to strong starts from big men Austin York and Ryan Boler, who scored 6 and 7 points respectively in the first two quarters. But once the second half rolled around, it was all Allatoona. The full court trapping defense of the Buccaneers collected 10 first half steals and eventually wore down on the Hoyas who were without guard DJ Rowe. In the first 16 minutes of play alone, Ephraim Tshimanga of Allatoona had 6 steals to his credit while Trey Doomes pick-pocketed 3. The duo of Doomes and Tshimanga was relentless all night as Tshimanga finished with 8 steals while Doomes collected 5. The Bucs busted the game open in the second half using a 10-0 run to open up a 35-22 advantage they would never be threatened to relinquish. Harrison found its first points of the second half on a York bucket inside at the 4:33 mark. York scored six of the Hoyas’ eight third quarter points and would score 15 in the half to total a game-high 21. 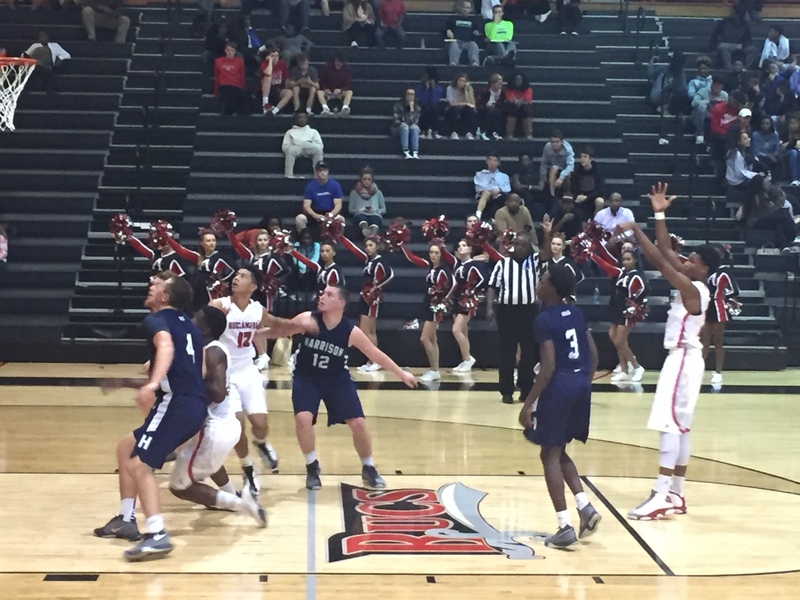 Allatoona outscored Harrison 16-to-8 in the third quarter to take a comfortable 41-30 lead into the fourth. Coach Markus Hood and the Bucs cruised to victory in the final frame and were able to play its bench big minutes to prepare for the regular season. 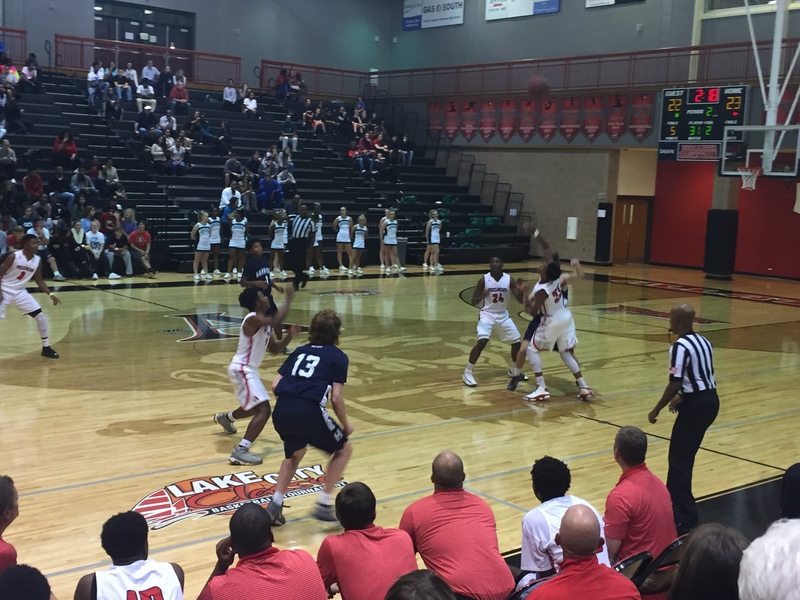 Turning Point: A 10-0 run to start the second half changed the momentum of the game and gave Allatoona the cushion it needed to hold off the Hoyas. The constant pressure defense applied by the Allatoona guards, primarily Ephraim Tshimanga and Trey Doomes, helped account for 17 Buccaneer steals. My Take: Allatoona will once again be a dangerous team come state playoff time. The Bucs lost a lot of seniors from last year’s state runner-up team, but in talking with Assistant Coach Craig Gaskins before the game, a few players are ready to step up and shoulder a bigger load. The Bucs’ trapping press was ultra-effective tonight. Ephraim Tshimanga and Trey Doomes were like pitbulls at times, hounding the Hoya ball handlers and not letting them advance the ball without harassing them. Kevin Perry, who signs with Coastal Georgia tomorrow morning, looked great as well tonight and showed a feathery touch, sinking two threes and going 6-of-6 from the line. As it did in the state championship last year, size inside could be the achilles heel for Allatoona. 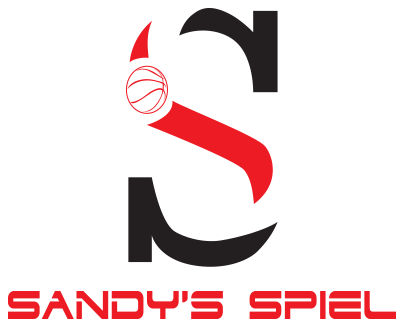 The cohesion along the perimeter will be as strong as it gets in the state, but Randy Legros will need to hold his own down low and give the Buccaneers second chances on the offensive glass and alter shots on defense. Chima Ogboi, a sophomore transfer from Mt. Paran Christian, impressed me with his hustle off the bench and could help spark the team at times this season. He finished with 6 rebounds. For Harrison, I am not aware of where DJ Rowe was (unless someone put another player’s name in his place in the scorebook). He was expected to be a big piece of the puzzle this season at the guard spot. Austin York performed admirably and carried the Hoyas. He can bang inside and showed nice footwork. York can also step outside and knock down the jumper. If someone can step up and help take some of the offensive burden off of York, the Hoyas have a chance to be sneaky team this season. Sophomore Jacques Holmes quietly turned heads as a freshman at Clinch County High School in south Georgia. Clinch County, home of less than 500 students and a part of the Class A-Public field, hasn’t won a state championship in basketball since the years of 1987 and 1989. A program that hasn’t seen that type of success in years, the Panthers aren’t one of the most publicized programs in the state, but after a freshman season which saw Holmes average 13.7 points per game and lead the Panthers in scoring, the playmaking guard hopes to put Clinch County back on the map. Holmes was named HoopSeen Class-A Freshman of the Year after his play helped the Panthers increase their win total by four games and finish the season 9-11. For those who haven’t heard of Holmes yet or don’t know his style of play, Jacques or his nickname pronounced “Joc”, gave me the inside scoop. To build on his rookie season success, Holmes stayed in the gym to fine tune his game. 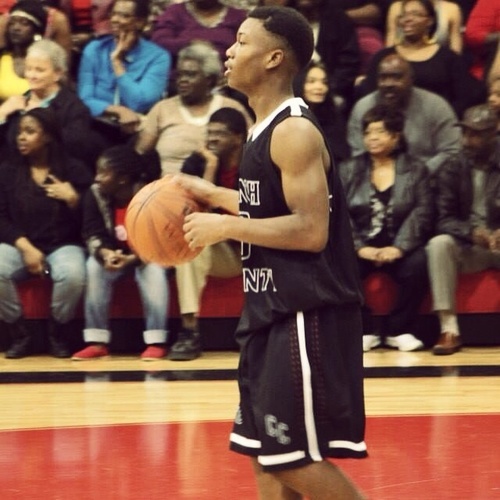 With its leading scorer another year older with a full-year of playing experience under his belt, Clinch County has high expectations this season to compete for a top seed in the region tournament and scrap for a state playoff berth. Holmes says that the team has put an emphasis on improving their defense and feels like their blend of size and speed can give opposing teams trouble. Junior Jerrod Jones will be one of Clinch County’s leading scorers to compliment Holmes’ abilities. He averaged over 10 points and 6 rebounds a game while handing out nearly 3 assists per night. “He’s a pretty good player. He’s very unselfish,” said Holmes of his teammate. In the halfcourt offense, Holmes and Jones should thrive in Coach Terrence George’s five-out pass-and-cut offense. The constant movement and ball-screens allow Holmes to drive and dish or finish at the basket. Playing at such a small school, I wondered what it was like and if it is difficult to get noticed by college scouts. One great player that Jacques looks forward to matching up with is Tamarrion Terry of the defending three-time Region 2-A champion, Turner County (25-4, 16-0). At his forward position, Terry garnered All-State Honorable Mention after averaging 17.1 points and 11.5 rebounds per contest. Coach George has taken the young Holmes under his wing and has helped mold him into the player he is now becoming. “He’s taught me a lot of things. The main thing he’s taught me is how to deal with certain situations, game situations,” he said. One part of the growing process has been being able to keep a level head during the rebuilding process that Clinch County has been undergoing. It has been a fight for the Panthers to reach .500. Leadership is something he has taken serious and wants to improve on over the next three years of his career.